I made real friends in prison, who gave me what little they had and helped me keep my sanity, to whom I owe a duty to tell what I can of conditions inside but at the same time those same considerations oblige me to tell only a fraction of the whole story. On 5th February 2012 I was arrested just off Mohamed Mahmoud street in central Cairo where I had been photographing a protest near the Ministry of Interior. A year earlier, on 27 January 2011 and just two days after the Egyptian uprising began, I had travelled to Cairo Airport to watch the arrival of opposition leader Mohamed El Baradei. Such was the huge welcoming crowd that I had to stand on a precipitous wall high above the car park in order to snap a few shots. There were only limited protests across Cairo and other Egyptian cities that night which were quickly dealt with by Egypt’s security forces, but the situation was to quickly become much uglier. 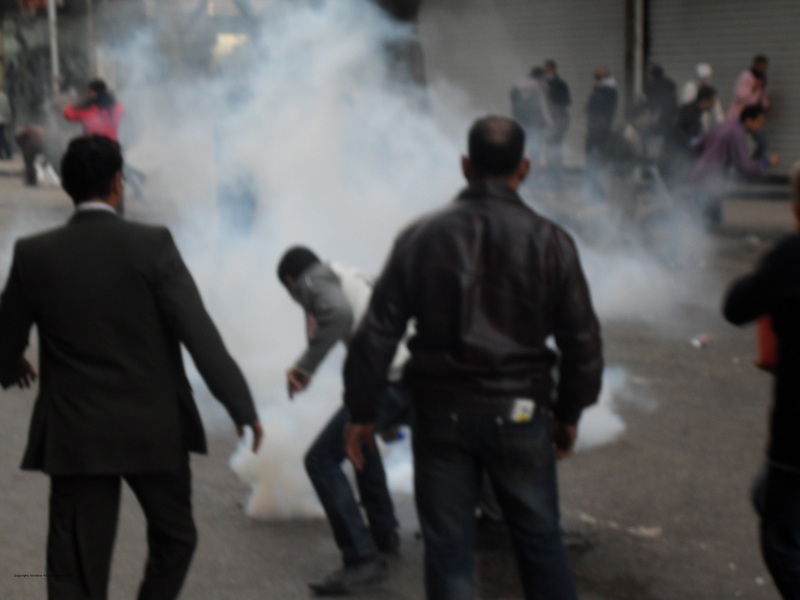 The next day, Friday 28 January, witnessed some of the most violent and deadly confrontations between the people and Egypt’s security forces. For my own part I had not the slightest interest in fighting as first it was not my country and second I always believed, perhaps naively, in the power of peaceful protest. I just wanted to be there to help document what was happening. Even so, I realized later the somewhat reckless way I had been putting myself and possibly my friends, should anything happen to me, at great risk. On the afternoon of Angry Friday while a well televised battle was waged on the bridges leading to Tahrir Square, I was on Talaat Harb, just to the East of the Square, where a smaller number of protesters fought running skirmishes with security forces. Here a protester attempts to pick up a gas canister and throw it back while pedestrians scatter in the background. As night fell, many of the protesters, frustrated by years of police brutality and corruption, began to rip up paving stones to arm themselves against the armed security forces who were using live ammunition in a brutal attempt to clear the Square. I escaped from the Square around midnight. By that time I had seen one person shot dead who’s body was hastily carried past me and from that moment I knew that the casualty toll would be high. A few hours later a hazy dawn revealed the smoldering wrecks of police vans which littered the streets and the blood stained pavements from hundreds of casualties. The police themselves had disappeared. By noon a jubilant crowd had filled Tahrir Square, some thinking that it would be all over within hours but that hard won moment didn’t come until two weeks later and after many more lives had been lost. At twilight on 11th February the crowd in Tahrir Square went wild at the news they had long waited for, Mubarak’s resignation. A dictator had fallen. Grown men cried with happiness. A soldier standing next to me became an instant celebratory as he was thrown in the air repeatedly. “The people and the army are one hand,” they shouted. The military had not opened fire on the protesters and a ring of tanks had seemingly protected the Square. The generals promised to hand over power within six months. 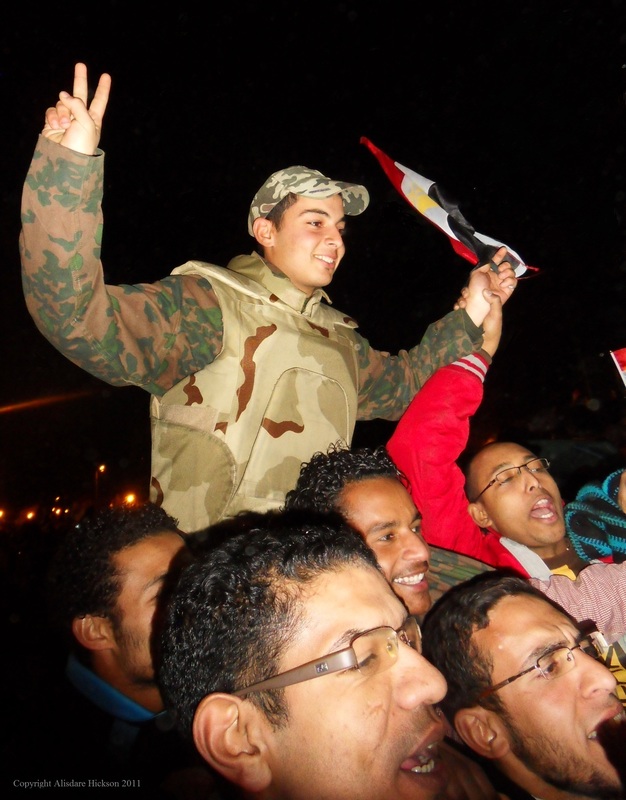 I snapped this photo of a young soldier carried shoulder high by the crowd – just minutes after the announcement of Mubarak’s resignation. However, it eventually dawned on the revolutionaries, more quickly on some than others, that perhaps this was not so much a revolution as a coup d’etat. A year later and despite parliamentary elections the military still wielded almost absolute power. It’s fig leaf civilian governments had crushed one protest after another with a combination of tear gas, brute military might and the use of baltagaya or hired criminals. Then on 1st February a massacre of football fans by thugs allegedly connected with the regime sparked off renewed protests across the country. The day of my arrest came four days later. The situation that day was scary but similar to other days when I had photographed riot situations but the gas being used seemed particularly toxic. The previous day I had seen many people vomiting and one man shaking in uncontrollable convulsions. So the morning of the fifth the protesters were understandably nervous. One insisted it was not safe and that I should leave. I wish I had taken his advice. 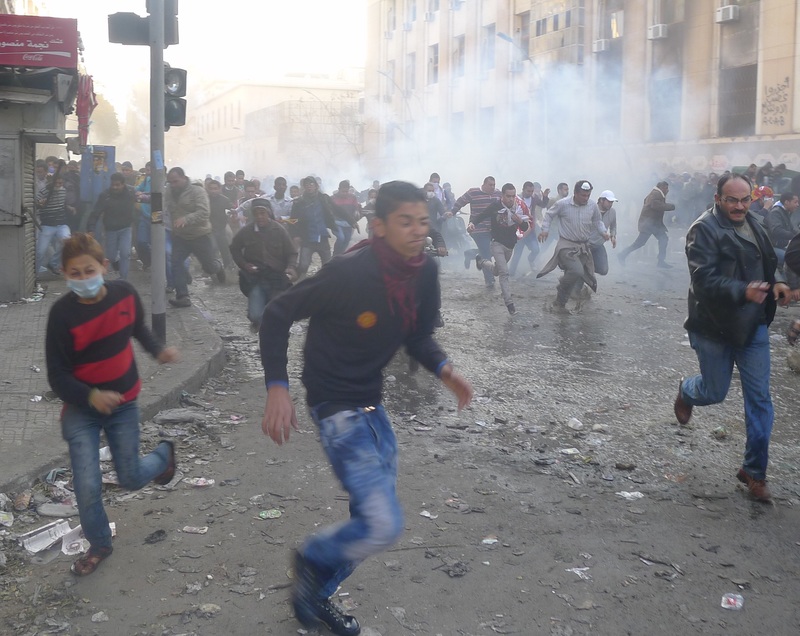 Every now and again the armoured police vans, sirens wailing and CSF soldiers or policemen shooting from the roofs, raced forwards and the demonstrators scattered. At one such moment around midday I photographed the protesters as they fled past me before I belatedly turned and ran with the last of them into a side street that led towards Falaky Square. A similar situation the previous day when I’d been stupid enough to stand at a street corner taking photographs as the crowd fled past me. I was hauled away and some moments later another of the policemen cried out “Jahoodi” (Jewish) and despite my quickly exclaiming “No English” I found myself being dragged along the ground. I was beaten twice on the top of my head and once on my forehead. I had everything including my two cameras, passport and wallet ripped from my hand and pockets. I was then frog marched to the Ministry of Interior building a few hundred metres away. Here I was interviewed by several seemingly senior officers, some of whom were in military uniform. There was a glass of water on a table but when I asked if I could have a drink I was told “only after you have answered all our questions.” One uniformed officer added “Don’t worry. You will soon tell us everything.” However about an hour later they relented, gave me a drink and asked a medic to treat my head injuries. I was then informed I was being charged with “stone throwing” – a completely false accusation. I later learned that 73 Egyptians and one fifty year old Korean woman were also arrested and charged with the same or similar acts of public violence that day. Most of them were released on bail or had their charges dropped altogether within the next month but I, along with some of the others, remained in custody a little longer. A few were even less fortunate and they were not released until the case finally came before the courts in November. I met the Korean woman several times in police vans. She was a small woman and obviously depressed about her situation but incredibly generous always offering her cigarettes and food to fellow prisoners. She said she ran a bed and breakfast back in Korea and insisted she had never thrown a stone. Not that I needed much convincing of her innocence. Not surprisingly some eventually took his advice. 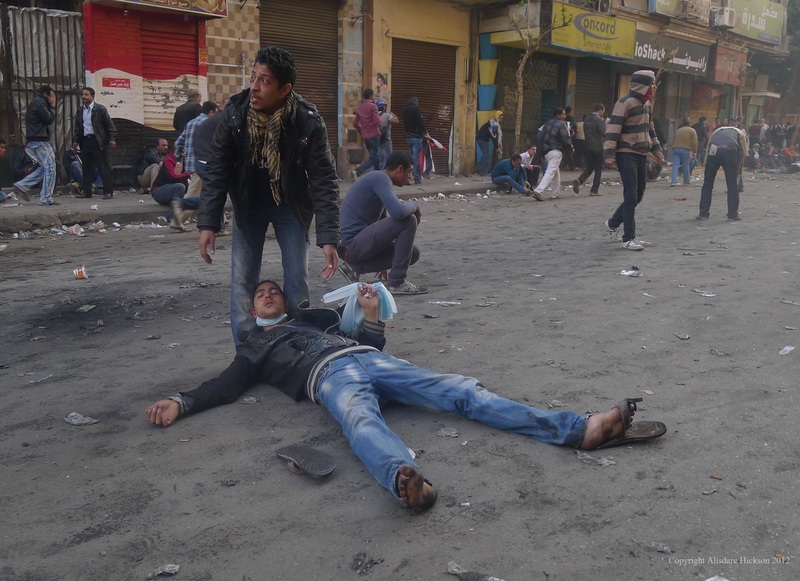 Perhaps they were used to sleeping in the street or on rough ground around Tahrir Square. They lay virtually on top of one another. I didn’t join them possibly because I was used to sleeping in five star hotels, and perhaps also because I was rather prim and British and feared that the officer might be about to take another humiliating photograph. So, despite a generous invitation from my immediate neighbour to rest my head, I sat upright shivering all night. The next day I was sent down to the basement cell. I trembled slightly as I was led down a long corridor and then down some stairs into a dark basement area and one of the prisoners reassured me “Don’t worry nothing will happen to you. It’s just somewhere you’ll stay for a few days” and at that the guards unbolted the heavy steel doors that led into what would be my home for the next eight days. This was the basement cell below the station, about nine by five metres, which I shared with thirty other prisoners. There were just three small heavily barred windows high up on wall letting in a tiny amount of light from the street above. There were no beds or mattresses – just a few blankets brought in by the prisoners’ relatives and barely enough space on the floor to sleep. At night I woke up every half hour as someone stepped on my legs in an attempt to reach the toilet/washroom. This was a tiny space of little more than one square metre cordened off by a dirty sheet with a single squat style toilet and a broken tap with water continually cascading down the wall. No soap was provided and the only place to hang clothes – one or two pieces at most – was a short piece of old string from which the partition sheet hung. I remember feeling lucky after I was able to wash myself one night but as soon as I left a prisoner vomited over my trousers – he was suffering the adverse effects of narcotics he had taken earlier that evening in tablet form. Many of the prisoners there were addicted to drugs of which there were plenty. I suspected that some police officers either turned a blind eye to the supplies reaching them from outside or possibly one of more were taking commission. Either that or they were incompetent. I saw one officer take money from a visitor bringing food which seemed suspicious but there were a few officers who seemed decent types in the station whom I hope would not have allowed such drug usage to thrive if they had known about it. This trade in drugs created a hierarchy of prisoners, with one prisoner regarded as the “kabeer” (boss) and he helped by several assistants. One day I was approached by one of these assistants and offered a falafel sandwich. I passed it to an old man next to me explaining that I wasn’t hungry and that the old man needed it more than me. He insisted however but I replied that I wasn’t hungry – at which he patted me on the neck. I didn’t realise anything had happened until a few seconds later a man sitting next to me told me that I was bleeding. It was only a small cut and the man returned later to apologise but it was a clear warning to obey the rules. He reminded me that I ought to be grateful to him as the previous night he had separated me from some prisoners who had showed an unusually keen interest in sleeping next to me. I told him there was “mafeesh mushkila” ( no problem ) and reassured him that I considered him a good friend. An outward smile hid how I was feeling inside. While wiping the blood off my neck with my fingers, it dawned on me just how low I had sunk. Three days earlier I had been helping myself to a lavish buffet at the Hilton Ramses and now I had been razored and might soon have to beg for food. I tried to push these negative thoughts aside and reassured myself that the nightmare would be over in days. I was due to attend my first magistrates court hearing four days after my arrest. Surely the judge would understand that a near fifty year old man with no crimminal record and with a huge portfolio of online photographs had not been in Mohamed Mahmoud Street to throw stones. However, as I watched in handcuffs from the prisoners’ cage in court, my lawyer, as in several subsequent sessions, was given less than a minute to put his case before the magistrate angrily waved his hand dismissively and declared that I would be given another fifteen days detention. Afterwards I was put into a police van assigned to take around twenty five children, all seemingly aged in their teens, to a prison and then to take me and a few of the children (possibly those who were to be released) back to Abdeen police station. (1) In fact I learned later that one boy who was just twelve had been among those originally arrested in and around Mohamed Mahmoud Street. He was beaten by the police and his fingers had been broken; the prosecutor advising him that it would “teach him a lesson”. (2) However I don’t know whether he was among those in the van or not. The van entered a huge prison with the word “Maaskar” (encampment) written on one of its’ gates. This is where most of the children were to be kept. We stopped and our escorts disembarked and relaxed by the roadside. Inside, however, with the air no longer rushing through the small meshed windows the temperature quickly climbed and the children began to beg for water. Then I thought it was out of genuine concern for my welfare but later I realised it was because they were afraid in case they might bruise my face – something which might be difficult to explain to anyone from my Embassy. Anyway, they left us but still without providing anything to drink. Soon afterwards one boy became crazy with fear. He wouldn’t stop shouting for water but luckily the guards ignored him. Then, about an hour and a half later – I’m not sure as I had no watch – one boy collapsed and was dragged out by his feet by the guards and the van door bolted again. It wasn’t until some more time had passed that the guards finally relented and brought water. The van then proceeded further into the prison complex and when it stopped I was briefly disembarked with the children. It was a godforsaken place with a foul odor of industrial chemicals and the thud of factory machinery came from nearby, interrupted every two or three minutes by an eerie wailing sound. It was like a man crying in distress but every time the piercing noise was an exact repeat of itself and it was obviously being broadcast through the prison loudspeakers. Even as we had approached, this sound had terrified the children. “Listen ! What is that ?” had asked one child peering through a tiny meshed window. Once back inside the van one of the guards asked the man to lift his shirt and I glanced discreetly sideways and could see all the many bruises and cuts that lined every few inches of his body. The guard asked “Why don’t you complain about this ?” but the man replied that he couldn’t. Every now and again he started trembling. Later he went down with me to the crowded cell below Abdeen Police station and every time someone approached him or made a quick movement he would tremble almost uncontrollably. It was a pitiful sight. The Abdeen basement cell was a nightmare. It was hot enough in winter with so many people crowded into a small area and with no fans I didn’t dare imagine what it must be like in summer when even the temperature outside might often exceed forty degrees. The air also often stank of burning plastic as the prisoners, lacking any kettle, would make tea in a bottle by setting fire to a plastic cup beneath it as it burned relatively slowly. Garbage was stored next to the tiny washroom area and as a result pieces of rubbish would block the drain so that raw sewage would often flood the cell. Luckily there was a small raised ledge around the room on which people could store their blankets and this was high enough to stay above flood level but there was no possibility of sleep for anyone until the drain could be cleared. There was an open manhole which exposed the sewer drain just on the inside of the cell door. Normally this had a large dirty cloth draped over it so that we didn’t have to be constantly reminded of the full reality of our squalid existence. Whenever there was a blockage the inmates themselves would try to clear the drain using improvised tools. I watched as one man pushed a cut down plastic bottle attached to the end of a pole for over an hour without any success. On this occasion and many others it had to be done by someone from outside the cell which usually meant waiting at least several hours. 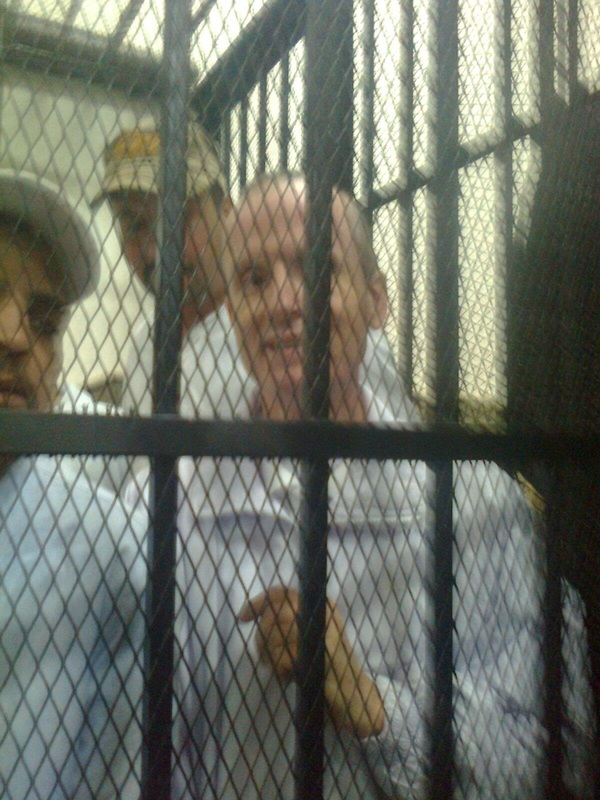 Fortunately after a few days I was transferred from Abdeen to a less uncomfortable cell of a more notorious prison, Tora. It covers a vast area, more like a city of prisons each with its’ own walls and watch towers serparating it from the other, all sandwiched between afluent suburbs in southern Cairo. It is one of the oldest in Egypt, one which held many former dissidents under Mubarak’s regime such as former Presidential candidate and opposition leader Ayman Nour. Ironically it may also soon house President Mubarak and his sons in a specially built section, but it also accomodates many prisoners of all types – including members of Sixth April Youth (a famous protest movement), former government ministers and street criminals accused of everything from drug trafficking to murder. Its’ famous inmates have unfairly earned it the reputation as a prison for the privileged but the treatment of its’ inmates has often been anything but. In 2006 forty prisoners on hunger strike were placed in solitary confinement, sexually assaulted and threatened with further violence until they agreed to suspend their strike five days later (HRAAP) and the next year the well known politician and former presidential candidate Ayman Nour was denied medical care for his diabetes and heart condition. More recently there have also been several shocking reports of torture and appalling conditions. In April 2011 a fifteen year old boy who was being kept alongside adults in a cell showed obvious signs of physical abuse (Euromid.org). In October the same year Essam Ali, a 23 year old, was allegedly sodomized with water pipes and then beaten to death by guards (AlKarama.org). Four months later, in February 2012, a seventeen year old boy sentenced to 15 years, was allegedly tortured by prison guards (Youtube interview) and in June 2012 an Austrian remand prisoner complained about corpses left lying to rot on his cell floor (Heute 18 06 2012 ). Incidentally the same cell I was allocated. Hans, the Austrian remand inmate and the source of the report about the rotting corpses, was already a veteran when I arrived. He and a German colleague had been there since November the previous year when they’d been arrested at Cairo airport with four guns and 200 rounds of ammunition in their luggage (Krone.at). Hans explained he’d been tricked by someone into thinking he had all the necessary paperwork whereas in fact he didn’t. So now for the first time he found himself in a prison. He spotted me having my head shaved in the prison atrium just after I had been checked-in and through a prison contact managed to arrange for me to share his large cell (along with 70 other inmates). He lent me a mattress and a pillow which might not seem a lot, but for the first time it meant I could sleep in some sort of comfort and when the next day my brother-in-law visited with half a dozen boxes of food and extra blankets I felt I was the luckiest prisoner in Egypt. The previous day on the way to Tora I had been in almost complete despair not knowing what to expect. I shared the prison van with an Ahly football club supporter, Hassan, who’s forehead was badly scarred with large stitches. I asked him about his circumstances in order to forget my own. He had been one of a thousand Ahly supporters who had been to watch a match on 1st February at Port Said. He and his fellow supporters however had found themselves locked in to the stadium as many of the ten thousand Al Masry fans, the home side, surged forwards with bottles, knives and clubs. In the resulting mayhem 71 people were killed. Many people blamed the tragedy on the Interior Ministry who were said to want revenge against the Ahly fans for their involvement in previous Tahrir Square clashes. Witnesses claimed that a number of unticketed armed thugs had been allowed to enter the stadium and that the main lights were turned off as police opened barriers separating the two sides. It was this tragedy that had provoked the protests on the following days around the Ministry of Interior, during which I was among several hundred detained. Hassan had managed to escape the stadium but was arrested as he tried to board a train for Cairo and he told me that he’d been charged with murder. This came as a huge surprise. I didn’t ask him how this had happened as I was too busy wondering where we were being taken to, but he struck me as a quiet thoughtful young man. Outnumbered ten to one by armed thugs, how was it that he was being charged with such a crime ? Once inside we had to abandon our civilian clothes and put on the thin white pyjama like prison uniforms. On the back of each was written the word “tahqeeq” meaning “under investigation.” We were led to the main prison building where they lined us up for the head shave – a fast but uncomfortable procedure which left me a small scar above my left ear which continued to bleed on and off for the next ten days. Our new home was Tora Mazraa, one of Tora’s five sub-prisons, which I was told was a five-star paradise by Egyptian prison standards and because I was a foreigner I had the good fortune to be located in one of the cells on the “first class” top floor. On my level the dormitory cells housed about seventy inmates each whereas downstairs they were of similar size but housed over a hundred each. Hassan had the misfortune to be allocated a cell downstairs and I only saw him once more when I was standing on the first floor walkway and he waiting outside his cell in the prison atrium below during a search. He called out “Alisdare” and waved up at me, but fellow prisoners had warned me against communicating with anyone who might be considered a political prisoner, as the authorities might view this negatively. I’m ashamed to say that although I briefly acknowledged his wave, I quickly turned round and walked away. As on many occasions inside I found it was easier to be a coward. I didn’t want to risk my first floor privileges. These were considerable. When I first arrived it was still winter and while many of the prisoners at ground level had to sleep on the cold tiled floor, there were empty beds in my cell which could be purchased by cigarettes to use as storage space. Later however after a number of raids discovered mobile phones in our cell, the authorities either as a punishment or because of an increase in the prison population, allocated more prisoners to us until we had a few prisoners sleeping two to a bed. The raid campaigns by police were a regular interruption of prison life. They were of two types – a speedy surprise visit by plain clothes investigation officers during the night looking for any sign of noise or light that might give away an inmate using a mobile phone or a much slower more methodical search by hundreds of armed police looking for drugs, sim cards or anything not allowed by the prison regulations. You knew a shakedown was coming long before it arrived. The security police would muster just after dawn in the prison yard, stamping their feet and psyching themselves up. “We are lions. They are monkeys,” they chanted in unison. “Look how they think of us ?” commented my immediate neighbour one time. “Monkeys are the more intelligent !” I replied as I watched a prisoner take out a sim card from his mobile, insert it into a moldy squeezed out orange and throw it in a bin. Luckily on the top-floor we usually only had to endure the quick surprise visits, but inmates on the ground floor suffered the more thorough shakedowns at least once a week. During such searches all the prisoners would be first frisked intimately and then forced to squat for hours outside while the police would turn the entire cell upside down, breaking open the prisoners’ boxes and bags of personal belongings and emptying their contents across the floor and beds, sometimes tearing up photographs and stealing anything valuable such as cigarettes. Upstairs we did not suffer nearly so badly and we hung our bags of belongings from nails over our beds with little fear of loosing the contents. These were narrow concrete bunk beds on which prisoners could place mattresses and blankets brought in by their relatives. The top beds adjacent the open barred windows were difficult for older prisoners – we had one man in our cell who was over eighty years old – to climb on to and get down from and they were the coldest at night during winter while the bottom ones were unbearably hot in the summer but a substantial payment of cigarettes to the kabeer (head prisoner) could usually secure a better located bed. At one end of the cell there was a small cell kitchen area and within it five basic but clean toilet/shower cubicles. Of these, one was what tourists might term a “European” type and this made me feel a little more at home and while the seat rim was broken and there was no toilet paper, at least there was a clean jug of water as a hygienic alternative. However, to put my name down for any of the cubicles I needed to pay several cartons of cigarettes to the Kabeer and the “Westernised” one was the most expensive. One disappointment was that the water supply was irregular and we had to use five litre plastic containers to store as much as possible while it was running. Another sharp contrast with Abdeen was in the provision of food. At least the prison provided some basic essentials. A small quantity of meat and chicken once a week, a box of salty white cheese several days a week, the flat round Egyptian balady bread every day and sometimes potatoes. Foul (black beans) on most days delivered in a bucket, lettuce once or twice a week and even one orange for every prisoner a week. There was no mess hall or designated eating area but some of the prisoners had obtained their own fold up plastic chairs and tables, brought in by their relatives, which they were able to set up at meal times in the cooking/washroom area. However there were also negative points. Although it was a remand prison, many inmates had been there for years under investigation – several in my cell for more than five. Under the constitution they should only be there up to a maximum of 24 months before sentence must be passed but due to emergency law the courts could impose indefinite delays. Prisoners often returned from court to tell us they’d been given yet another six month delay. Also almost none of the prisoners were allowed any exercise. There was a dilapidated basket ball court in the yard outside but I was told no one had been allowed to use it for over a year. One day however a rumour spread that a human rights organization would visit the next Saturday and one of my friends noticing I was looking very depressed pressured me into putting my name on the list. I was a bit reluctant as I’m absolutely useless at any type of football. However I needn’t have worried as when the day came, the cell door remained closed. There was no human rights group to visit and no basketball or football. However due to pressure from Western Embassies three of us from my cell, myself, a German man and an Austrian man and two others from neighbouring cells, an American and another British man, were allowed out three or four times a week for an hour or so to walk along the narrow walkway that ran between the cells on the first floor. I always tried to walk forty lengths of the prison block which was a bit difficult as there was so much washing hanging over the walkway. The other prisoners were less fortunate unless they were working in the prison factory (some of them did this to earn enough to buy a few cigarettes) or had other more privileged prison jobs such as the prisoner barber or those running errands for the prison officers or one IT expert who was assigned to fixing the prison’s computers. However most prisoners never got out of the cell except for on Friday prayers or when they had to go to court. The journey to court and back was always an unpleasant experience. We were often for hours without water or access to any toilet. Prisoners would sometimes have to urinate or even defecate inside the van. Humiliating for them and everyone else. I learned to carry a double page of a newspaper to sit on, some concealed cigarettes which I might need to bribe a guard for water or to access a toilet after arrival in the court and at least one large bottle of water which could be life-saving even though it might only last a few minutes in a van full of thirsty prisoners. An empty bottle was also useful to urinate in. Inside the van I would no longer be with the same company of judges, generals and business men as in my first class cell but crammed with many prisoners of all types. I would always look down at the floor to avoid eye-contact with the more difficult ones, a few of whom took it as a sport to humiliate a foreigner in front of their mates. I was frequently insulted and once had rubbish thrown at me which didn’t improve the appearance of my prison clothes in front of the judge. However usually there would be at least one or two prisoners brave enough to speak up for me. One of these was George Ramzi, a fresh faced young man and a member of the Sixth of April Youth. He had been arrested on 6th February during the protests around the Interior Ministry and falsely charged with throwing stones and obstructing the traffic. He walked with a limp due to having being tortured with electric shock treatment when he was first detained at the Ministry of Interior and his eyes were still slightly bruised from the beetings he had received. However he was not a man to be easily subdued. Several times in vans and at court he called me over with a charismatic smile and offered me the little food he had. He was afraid of no one and on the last day I was with him while we having our records checked at Cairo’s Police Directorate – shortly before my release – he began to chant anti-government slogans. “George, can’t you wait a few hours until you are released ?” I asked him impatiently. He took no notice and continued his verbal assault on the regime and the police and I’m ashamed to admit that, as I was lucky enough not then to be handcuffed to anyone, I walked away. I prayed that the police would forget that we had been chatting together. Fortunately for us both they took no notice. George was released later that day to a rapturous crowd of his supporters who had gathered outside Abdeen police station. They were so loud that we could easily hear their voices from the basement cell. It helped lift the gloom pervading that otherwise spiritless place. But even the cell at Abdeen was preferable to the overcrowded vans. Many of the handcuffed prisoners could not sit but had to stand or crouch between the seats. The driver, negotiating Cairo’s chaotic traffic, would frequently have to brake hard causing prisoners to fall on top of each other. Even so handcuffed women were sometimes forced to travel with us although on one ocassion the guards relented after the prisoners shouted “haram alaik“, What you are doing is wrong by Allah ! Another worry were the protests as police vans were an obvious target. Hundreds had been burned during the revolution and I remember once on Talaat Harb street, close to Tahrir Square, some prisoners becoming concerned as a crowd of protesters neared and one of us shouted “we are prisoners” through one of the tiny meshed windows. Whether out of fear of arson or hope of liberation I don’t know. The crowd outside may or may not have heard him but they didn’t seem to be intent on any violence. I was always relieved to get back to the relative safety of my five star prison cell. Life here was boring but survivable as long as you didn’t fall ill. If you did there was a basic medical centre with some friendly staff, but there was only a very limited stock of medicines and inmates could wait months for anything which required hospital treatment. There was one man in my cell who could hardly walk during the last three weeks I was there. He was a German national by the name of Frank. He was the only other European in my cell besides the Austrian Hannes. In March Frank suffered a knee injury but there was absolutely no diagnostic equipment in the prison. Frank was probably my most trusted friend at Tora. He used to sit on my prison bed and tell me stories of gun battles with Somali pirates and Brazilian drug gangs. I was grateful as it helped kill the time which otherwise crawled past painfully slowly. He didn’t share my liberal political views but he was always kind and considerate and his advice helped to keep me sane. Each week Frank was promised an appointment the next week for an x-ray at the local hospital but on the appointed day no transport would arrive. This was despite his relatively privileged status as a prisoner with a powerful embassy to protect him. I hope that perhaps by now if his embassy has complained enough times, he might have at least had his problem diagnosed but how long he might have to wait for treatment I don’t know. When I left the prison authorities hadn’t even been able to provide any crutches to help him struggle from his bed to the washroom area. If this is the sort of treatment on the first class floor of Egypt’s best prison, what can other prisoners expect ? Unfortunately his was far from the only example of neglect at Tora. At night prisoners would sometimes fall ill and you could often hear someone repeatedly screaming “A man is very ill” or “A man is dying” but it would often be hours and sometimes not until the next morning that anyone would come. It’s possible that they were indifferent or it is possible that they feared being tricked and taken hostage as there weren’t enough guards. The prison building I was in was accommodating nearly a thousand prisoners in just eight main cells. That is apart from the small punishment cells. These places were one of the prisoners’ worst fears. They were reserved for those who were caught with money or mobile phones in their possession or whom for any other reason were thought deserving of punishment by the prison authorities. Fortunately I never saw any of the punishment cells. I was told they were located near the prison factory and that any prisoner was only allowed to take his prison shirt and trousers and no other possessions. He had to sleep in a small space on the floor sharing it with several other sometimes violent crimminals with almost no food and due to the lack of any blanket would really feel the cold at night as it was still winter. I was probably the luckiest of all the prisoners as my friends and family outside once aware of my situation worked very hard to organize my legal defence and keep me supplied with food. Luckily at the prison where I was family visits were allowed once a week and my brother-in-law kept me supplied with apples, organges, grapes, chicken, chocolate, milk, raisins, fresh vegetables, fresh cheese, packet soups, clothes, blankets, deoderants and even CK one perfume. To do this he had to stand in a queue for many hours every visiting day. He always looked a lot more tired than I did. Running from court to court, doing all the donkey work of evidence collecting and finding lawyers in between his trying to manage his business must have taken a heavy toll. How I will ever thank him I don’t know. In prison you really do get to discover who your real friends are, who will really care for you when the chips are down. My tireless brother-in-law, my sister and Peter Tatchell, a prominent human rights campaigner in London, worked around the clock lobbying the British Embassy and FCO for me in London and towards the end of my time in prison the Embassy became much more supportive. However their initial help amounted to little more than one beef sandwhich, an ancient copy of the Daily Telegraph which was useful in covering the adjacent jail window at night, some leaflets with advice about taking up prison work ( hard labour) to pass the time which had all the inmates laughing and the routine passing on of messages and requests. However in my last two weeks there was a complete change and they really did try to use their influence with the Egyptian government and prison authorities on my behalf. From early on my one great hope was that I would finally get out because of the weakness of the prosecution case against me. One police report said that the witness was by himself when he arrested me. Another said he arrested me with the help of other civilians whose names the police station had failed to record. One police report said the witness was standing next to me when I threw the stones. Another said he was twenty five metres away. In one report the witness said he took me directly to Abdeen Police Station. In another he said he took me to the Ministry of Interior. In both reports he stated that I had an old head wound, while the hotel receptionist when interviewed by the prosecutor said I had no such wound when I left just two hours earlier. Finally the witness said he was in the area because he was “standing by his place of work – a building of the Ministry of Finance at the junction of Mansour and Mohamed Mahmoud streets” – presumably the tax office but this building had been badly burned two days earlier and so the reason for his being there is puzzling. And he passed what for Egypt was an unusual judgement. Foreign prisoners told me it was virtually impossible for any of them to get bail because as one of them put it “the borders of the country are like Swiss cheese” – it’s too easy to escape. Yet despite this the magistrate granted bail for nothing. But I would need to go back to the prison for just two or three days while the paperwork was processed. Then on the morning of day 49 came an unwelcome shock. The cell door opened and my name was called. “Gilsa” (court). How could this be ? I was sure there must be some mistake. I guessed that the guard didn’t understand. I was probably about to be released. “This is good news” I optimistically told a friend. However while I waited in the prison yard with about forty other prisoners who were waiting for transportation to various courts – the bad news came. An officer told me that the prosecutor had appealed the previous court’s decision and that another more senior judge would make a new decision. Luckily my brother in law had been up early in the morning to check my papers at Abdeen court and noticed that my case had been appealed. No one had informed him or my lawyer and it was only after a lot of talking by phone that my brother-in-law persuaded my lawyer to abandon another court hearing and drive over to the court where I was awaiting my hearing. There was even one piece of computer language by some, obviously bored, IT prisoner. When I got tired I sat down on the floor and stared upwards out of the small barred window trying to work out from the position of the shadows what time of day it might be. After several hours I heard a guard approach and then the cell’s metal door opened. Two guards led me up several flights of stairs to stand before a judge in a small room (due to overcrowding many of the court sessions actually took place in offices rather than court rooms). He seemed surprisingly human, smiled occasionally and asked me only a few questions; the last of which was why my hand was shaking – I replied that it was because I felt that I had fallen into some dark hole and didn’t understand what was happening around me. Fortunately he was also sympathetic and renewed the decision to give me bail even though it was this time set at one thousand Egyptian pounds (about 170 dollars). But even then my difficulties were not over – after routine processing at the Police Directorate and at the Prosecutor’s Office I was sent at night (day 51/52) to the State Security offices at the Ministry of Interior. Although it wasn’t my first visit, the sight of the huge building topped by a giant aerial mast and ringed by barricades and soldiers in armoured personnel carriers, made me uneasy. It is a vast intimidating edifice of the type popular with fascist dictators, with no windows on its’ ground or first floors and the main entrance accessed via a castle-sized black metal gate which opens electronically. However the reception for State Security, at least for visitors with prior appointments, is surprisingly modest, a small side-door, protected by a metal grill gate and virtually hidden behind a tree. Once inside my guard and I were directed into a comfortable waiting room which also seemed to have the only kettle on the building’s ground floor. Every few minutes officers, dressed variously in suits, leather jackets or occasionally military uniforms would come in to brew some tea. One even offered me some and asked me how I’d ended up in handcuffs – I explained my story and he politely apologized. It was very different from my first visit fifty days earlier. However, the wait that night was to no avail – no decision was taken on whether I might be released with or without a travel ban – and I was sent back to the police station cell where I managed to get about two hours sleep – and then back again to State Security the next day – this time together with a Palestinian man who had just finished a one year prison sentence. Finally, after a six hour wait, a decision was issued. It came , bizarely given that this was State Security, in an unsealed brown envelope and our guards agreed to show us the decision which in both our (unrelated) cases was “tarheel” – deportation. But for the meantime it was yet again back to the police station cell to await the final day of bureaucratic processing. It was a difficult night in the cell. One of the inmates was a mentally handicapped man and some of the other prisoners became annoyed when he didn’t understand what they asked him to do. “Pick up the paper” one of the kabeera of the cell would shout and the man would just stare into space. Several times he was beaten with a leather belt on the head and on his back and once he was lifted up by several prisoners so that his feet were in the air and the kabeer (head prisoner) beat them time and time again. A Palestinian man next to me loudly asked “why ?” I warned him quietly “Don’t. You’ll get both of us (I was his friend) into a difficult situation. We are both about to get released.” Then I pulled him away to the far side of the room. I’m afraid I was a coward in prison. I was ready to get out at almost any ethical cost. At least one police officer at Abdeen was aware of the mentally handicapped man’s status. He was the officer who came down to conduct the evening roll call at which time we had to squat on our knees in rows of five ( khamsaat ). The mentally handicapped man would not squat. He didn’t even seem to understand the request. It reminded me of how he tried to pray with other prisoners when they lined up for prayers but he seemed unable to go through all the motions though the intent was obviously there. Now in the presence of the officer, some of the prisoners offered to beat him but the officer, realising he was mentally handicapped, allowed him to continue standing. However he should never have been permitted to remain in the cell as his welfare and possibly his life were clearly in danger. According to Article 35 of Egypt’s Criminal Procedure Code a doctor should have examined him and if he had decided that the inmate was mentally disturbed, have any such prisoner immediately transferred to a mental hospital ( EOHR report.) Anyway I decided not to jeopardize my own chances of freedom by raising the issue. The next day I was taken in handcuffs to the Immigration Directorate located on the second floor of a vast 14 storey government building known as the Mugamma on Tahrir Square. As I passed a few protesters’ tents still pitched below the building I heard someone call out my name but I didn’t turn round. Then, once inside and seated in the small detention area of the Directorate I waited anxiously for a few hours before an officer finally stamped my emergency passport (kindly supplied at the very last minute by the British Embassy) with the official reason for my deportation – overstaying my visa – somewhat odd in view of the fact that my most recent visa was less than two days old when I had been imprisoned. How had they expected me to renew it ? The real reason I’m sure was that they did not wish to allow me any chance to win my case. By effectively banning me from attending my own trial they assured they could prevent any chance of justice being served. So finally they sent me with two police officers to the airport where I was kept in a relatively comfortable detention centre which had tables and chairs and a washroom – an amazing luxury. It was full mostly of Palestinians, one of whom while travelling from Jordan to Gaza had the temerity to assume that his three day transit visa allowed him to exit the airport and stay in Cairo. In the early hours of the morning I was beckoned into the washroom by the officer in charge who asked me if I needed information on when I would leave the centre in order to board my flight. He rubbed his thumb and first two fingers together to suggest he needed cash but all I had to offer him were two packets of local Cleopatra cigarettes which might be why I was now allowed to leave the detention area until thirty minutes before my flight when I was finally taken to the gate or at least almost. Strangely my two accompanying guards released me some fifty metres away – pointing out the gate number with the sure knowledge I expect that I was unlikely to try to escape back into Egypt. They weren’t wrong. I was probably the happiest man on the plane. Do you have any experience or knowledge about prisons in Egypt or do you know a friend or relative who suffered imprisonment ? Or even if you just have an opinion on anything written above please feel welcome to write a comment. Thanks Alisdare Hickson – blog author. There are also two articles in the Canadian Observer – the first covering some of my comments about Tora prison and the second (very similar to the one on Canada’s Sun News Network) regarding the difficulties I had adjusting to normal life after prison. 1. My mind was so distracted by the injured man who was handcuffed to me and shared the journey with me back to Abdeen that I can’t be absolutely certain there were also children with me on the return journey but I think two or three of the younger children remained in the van. 2. Egypt Independent Sunday 19 February 2012 – Children in jail: Did the Interior Ministry violate children’s rights? – Amina Ismail and Deena Adel.